** The Lewis structure of a molecule tells us the number of pairs of electrons in the valence shell of the central atom. These electron pairs are subject to electrostatic attractions between them. On this basis, R.G.Gillespie (1970) proposed a theory called the Valence-Shell Electron Pair Repulsion or VSEPR (pronounced as ‘Vesper’) theory. ** VSEPR Theory states that : The electron pairs (both lone pairs and shared pairs, surrounding the central atom will be arranged in space as far apart as possible to minimise the electrostatic repulsion between them. ** Let us consider the simplest case of an atom with two electron pairs. We wish to place the electron pairs on the surface of a sphere such that they will be as far apart as possible so as to minimise repulsion between them. Fig (1) illustrates it by showing some possible placements of the two electron pairs. The arrangement in which the electron pair-central atom-electron pair angles is 180º, makes the electron pairs farthest apart. This arrangement is called linear because the electron pairs and the central atom are in a straight line. (1) Multiple bonds behave as a single electron-pair bond for the purpose of VSEPR. They represent a single group of electrons. ** When a molecule has lone pairs of electrons, the bonding electron pairs are pushed closer and thus the bond angle is decreased. 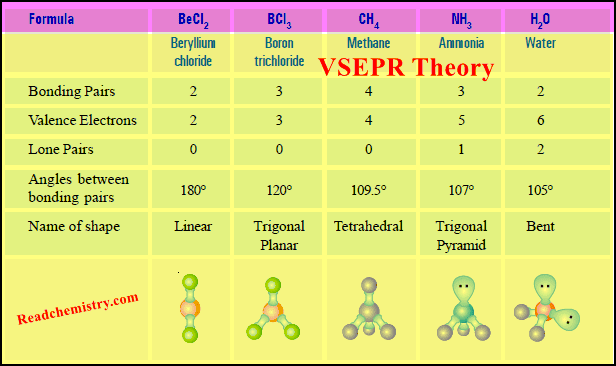 ** Now we proceed to work out the shapes of some common molecules with the help of VSEPR theory. ** The central atom Be has two bonding electron pairs and no unshared electron. ** According to VSEPR theory, the bonding pairs will occupy positions on opposite sides of Be forming an angle of 180º. An angle of 180º gives a straight line. Therefore, BeCl2 molecule is linear. ** In general, all molecules as A–B–A which have only two bonds and no unshared electrons are linear. ** The central C atom has no unshared electron. We know that a double bond counts the same as a single bond in VSEPR model. Thus CO2 is a linear molecule. ** Similarly, it can be shown that hydrogen cyanide (H – C ≡ N) and acetylene (H – C ≡ C – H) are linear molecules. ** Its Lewis structure shown that the central atom B has three bonding electron pairs and no unshared electrons. ** VSEPR theory says that the three bonding electron pairs will be as far apart as possible. This can be so if these electron pairs are directed to the corners of an equilateral triangle. Thus VSEPR model of BF3 molecule has three F atoms at the corners of the triangle with B atom at its centre. ** All the four atoms (three F and one B) lie in the same plane. Therefore, the shape of such a molecule is called trigonal planar. The bond angle is 120º. ** The central S atom is joined with two O atoms by covalent bonds. The third O atom is joined with S by a double bond. But a double bond is counted as a single electron pair for the purpose of VSEPR model. Therefore, in effect, S has three electron pairs around it. Thus like BF3, SO3 has trigonal planar geometry. ** Lewis structure of methane shows that the central C atom has four bonding electron pairs. These electron pairs repel each other and are thus directed to the four corners of a regular tetrahedron. ** A regular tetrahedron is a solid figure with four faces which are equilateral triangles. All bond angles are 109.5º. ** Similarly, CCl4 in which the central C atom is bonded to four other atoms by covalent bonds has tetrahedral shape. 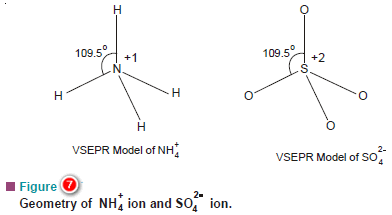 The N atom in NH4+ and S atom in SO4-2 have four electron pairs in the valence shell. These are directed to the corners of a tetrahedron for maximum separation from each other. Thus both NH4+ and SO4-2 have tetrahedral shape. ** The Lewis structure of NH3 shows that the central N atom has three bonding electrons and one lone electron pair. ** The VSEPR theory says that these electron pairs are directed to the corners of a tetrahedron. 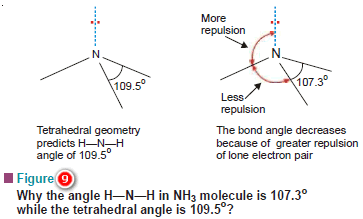 Thus we predict that H–N–H bond angle should be 109.5º. But the shape of a molecule is determined by the arrangement of atoms and not the unshared electrons. 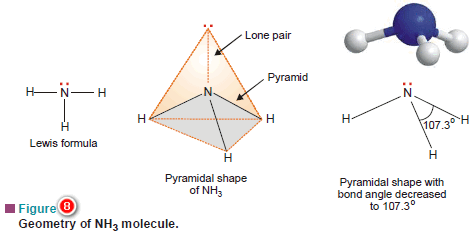 Thus, if we see only at the atoms, we can visualise NH3 molecule as a pyramid with the N atom located at the apex and H atoms at the three corners of the triangular base. ** All molecules in which the N atom is joined to three other atoms by covalent bonds, have pyramidal shape. For example, amines RNH2, R2NH and R3N have pyramidal shape. ** The structural formula indicates that the central phosphorus atom has three bonding electron pairs and one lone electron pair. 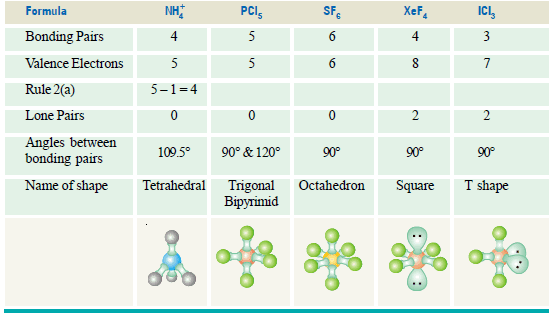 ** Thus, like NH3 it has pyramidal shape and the observed bond angle Cl–P–Cl is 100º. ** In the structural formula of H2O, the O atom is bonded to two H atoms by covalent bonds and has two lone pairs.Thus O is surrounded by two bonding electron pairs and two unshared electron pairs. ** VSEPR theory says that in order to secure maximum separation between them, the four electron pairs are directed to the corners of a tetrahedron. If we look at the three atoms (and ignore the unshared pairs), the atoms HOH lie in the same plane and the predicted bond angle is 109.5º. But with two unshared pairs repelling the bonding pairs, the bond angle is compressed to 105º, the experimental value. ** Thus the H2O molecule is flat and bent at an angle at the O atom. Such a molecule is called a bent molecule or angular molecule. ** The Lewis structure of SO2 is given below. ** The S atom is bonded to one O by a double bond and to the other O by a single bond. It has an unshared electron pair. ** In VSEPR model a double bond is counted as a single electron pair. That way, the S atom is surrounded by three electron pairs, two bonding pairs and one unshared pair. For maximum separation the three electron pairs are directed to the corners of an equilateral triangle. The predicted bond angle is 120º. But with the unshared electron pair repelling the bonding electron pairs, the bond angle is actually reduced somewhat. ** Thus SO2 has a planar bent molecule with the observed bond angle 119.5º. ** The directional nature of covalent bonds is shown in the diagrams of molecules above. 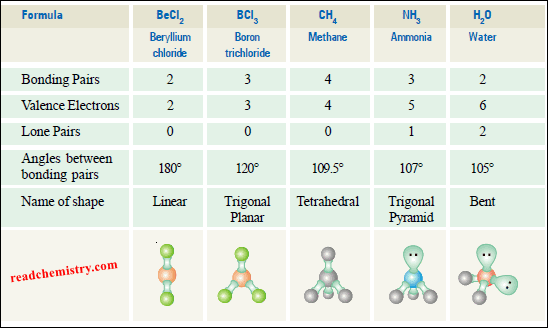 ** The shape of the methane molecule is tetrahedral because the four bonding pairs of electrons repel each other equally, and the equilibrium position of all four bonding electron pairs is tetrahedral. It is possible to work out the shape of a small molecule that has a formula XYn by applying a few simple rules. We will use ammonia as an example to illustrate the idea. First find the number of bonding pairs of electrons in the molecule. The number of bonding pairs of electrons in the molecule NH3 can be seen in the formula. There must be three bonding pairs of electrons holding the three hydrogen onto the nitrogen. Find the number of valence electrons (electrons in the outer energy level) on an atom of the central atom (The one of which there is only one.) Nitrogen is in group V, so the nitrogen has five electrons in the outer energy level. Find the number of lone pairs on the central atom by subtracting the number of bonding pairs (3) from the valence electrons (5) to find the number of electrons (2) that will make up lone pairs of electrons. Divide this number by 2 to find the number of lone pairs, 2/2 = 1. Distribute all the electron pairs around the central atom and learn the angles they will make from molecules with no lone pairs. Learn that the repulsion between lone pairs of electrons is greater than the repulsion between bonding pairs, and subtract 2o from the bond angles for every lone pair. Learn the names of the shapes. The shapes are named from the position of the atoms and not the position of the orbitals. There is one more rule to learn, and it concerns the shape of polyatomic ions. Rule 2(a): If the molecule is an ion, e.g. ammonium (NH4+), subtract 1 from the number of valence electrons for every + charge on the ion and add 1 to the valence number for every - charge, then proceed as before. Reference: Essentials of Physical Chemistry /Arun Bahl, B.S Bahl and G.D. Tuli / multicolour edition.